For much of her career, Graybiel has focused on the physiology of the striatum, a basal ganglia structure implicated in the control of movement, cognition, habit formation, and decision-making. In the late 1970s, Graybiel discovered that while striatal neurons appeared to be an amorphous mass, they were in fact organized into chemical compartments, which she termed striosomes. Later research revealed links between striosomal abnormalities and neurological disorders, such as mood dysfunction in Huntingdon’s disease and depletion of dopamine in Parkinson's disease. Graybiel’s subsequent research demonstrated how modular organization of the striatum relates to cognition, learning, and habit formation. She found that neurons project from areas in the sensory and motor cortices governing the same body part and cluster together in the striatum, forming matrisomes. Graybiel went on to show that matrisomes exist for each body part and were organized into loops connecting the neocortex, a region responsible for cognition, perception and motor control, to the brain stem, a region coordinating movement. Studies of rodents and primates revealed that matrisomes were crucial to habit formation. In later work, Graybiel demonstrated, first in the striatum and later in the infralimbic cortex, that a task-bracket or “chunking” pattern of neuronal activity emerges when a habit is formed, wherein neurons activate when a habitual task is initiated, show little activity during the task, and reactivate when the task is completed. In more recent work, Graybiel has focused on identifying specific pathways underlying aspects of behavior such as habit formation, learning and cognition, and decision-making, including being the first to analyze the effect of dopamine depletion on the activity of neurons affected by Parkinson's disease during behavioral tasks. Graybiel majored in biology and chemistry at Harvard University, receiving her bachelor's degree in 1964. After receiving an MA in biology from Tufts University in 1966, she began doctoral study in psychology and brain science at MIT under the direction of Hans-Lukas Teuber and Walle Nauta. 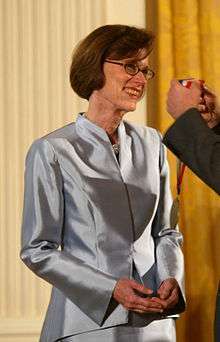 She received her PhD in 1971 and joined the MIT faculty in 1973. In 1994, she was named the Walter A. Rosenblith Professor Neuroscience in the Department of Brain and Cognitive Science and was named an Investigator at the MIT McGovern Institute for Brain research in 2001. She was named Institute Professor in 2008. She is a member of the US National Academy of Sciences, the American Academy of Arts and Sciences, and the National Academy of Medicine (formerly Institute of Medicine). ↑ Graybiel, AM; Ragsdale, Jr., CW (November 1978). "Histochemically distinct compartments in the striatum of human, monkey, and cat demonstrated by acetylthiocholinesterase staining". Proc Natl Acad Sci U S A (published 1978). 75 (11): 5723–26. doi:10.1073/pnas.75.11.5723. PMID 103101. Retrieved 23 October 2014. ↑ Tippet, LJ; Waldvogel, HJ; Thomas, SJ; Hogg, VM; van Roon-Mom, W; Synek, BJ; Graybiel, AM; Faull, RL (Jan 2007). "Striosomes and mood dysfunction in Huntington's disease". Brain. 130 (1): 206–21. doi:10.1093/brain/awl243. PMID 17040921. Retrieved 23 October 2014. ↑ Roffler-Tarlov, S; Graybiel, AM (5 Jan 1984). "Weaver mutation has differential effects on the dopamine-containing innervation of the limbic and nonlimbic striatum". Nature. 307: 62–66. doi:10.1038/307062a0. Retrieved 23 October 2014. ↑ Flaherty, AW; Graybiel, AM (1991). "Corticostriatal transformations in the primate somatosensory system. Projections from physiologically mapped body-part representations.". J Neurophysiol. 66: 1249–63. Retrieved 23 October 2014. ↑ Graybiel, AM; Toshihiko, A; Flaherty, AW; Kimura, M (1994). "The basal ganglia and adaptive motor control". Science. 265 (5180): 1826–31. doi:10.1126/science.8091209. JSTOR 2884650. ↑ Illing, R.-B. ; Graybiel, AM (1994). "Pattern formation in the developing superior colliculus: Ontogeny of the periodic architecture in the intermediate layers". Journal of Comparative Neurology. 340 (3): 311–27. doi:10.1002/cne.903400303. Retrieved 23 October 2014. 1 2 Graybiel, AM (1998). "The Basal Gangila and Chunking of Action Repertoires". Neurobiology of Learning and Memory. 340 (3): 119–36. doi:10.1006/nlme.1998.3843. PMID 9753592. ↑ Smith, KS; Graybiel, AM (July 2013). "A dual operator view of habitual behavior reflecting cortical and striatal dynamics". Neuron. 79 (2): 361–74. doi:10.1016/j.neuron.2013.05.038. Retrieved 23 October 2014. ↑ Hernandez, LF; Kubota, Y; Hu, D; Howe, MW; Lemaire, N; Graybiel, AM (2013). "Selective effects of dopamine depletion and L-DOPA therapy on learning-related firing dynamics of striatal neurons". Journal of Neuroscience. 33 (11): 4782–95. doi:10.1523/JNEUROSCI.3746-12.2013. Retrieved 23 October 2014. ↑ Trafton, Anne (12 March 2013). "MIT News". Breaking down the Parkinson’s pathway. Retrieved 23 October 2014. 1 2 "Neuroscience Laureate Biographies". The Kavli Foundation. Retrieved 23 October 2014. 1 2 3 "Ann Graybiel". McGovern Institute for Brain Research at MIT. Retrieved 23 October 2014. ↑ Ann Graybiel named Institute Professor – MIT News Office. Web.mit.edu (2008-11-03). Retrieved on 2012-06-25. ↑ US NSF – The President's National Medal of Science: Recipient Details. Nsf.gov. Retrieved on 2012-06-25. ↑ The Kavli Prize. Kavliprize.no. Retrieved on 2012-06-25. Wikimedia Commons has media related to Ann Graybiel. Profile of Graybiel in the MIT Technology Review.